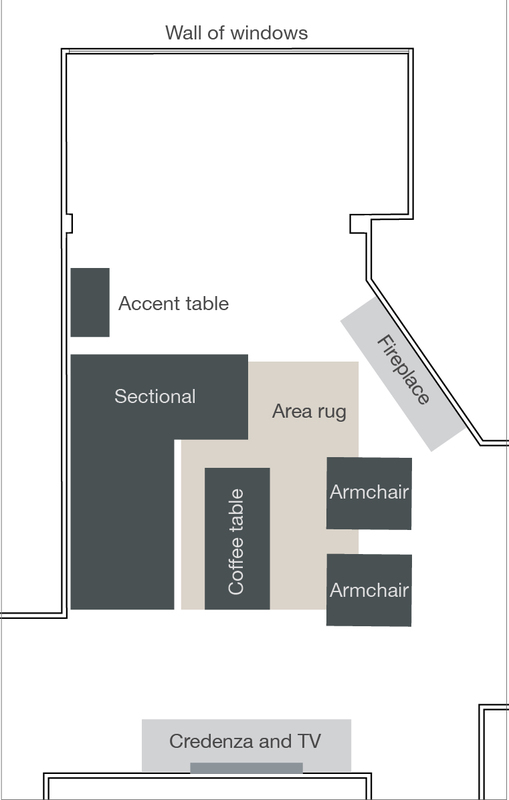 This is a long post about living room furniture placement. If you're into reading about that sort of thing, grab a pop-tart and hunker down for an in-depth look into the weird way my mind works. If you're not into that sort of thing, grab a pop-tart and scroll down for some diagrams that might be more interesting for you. 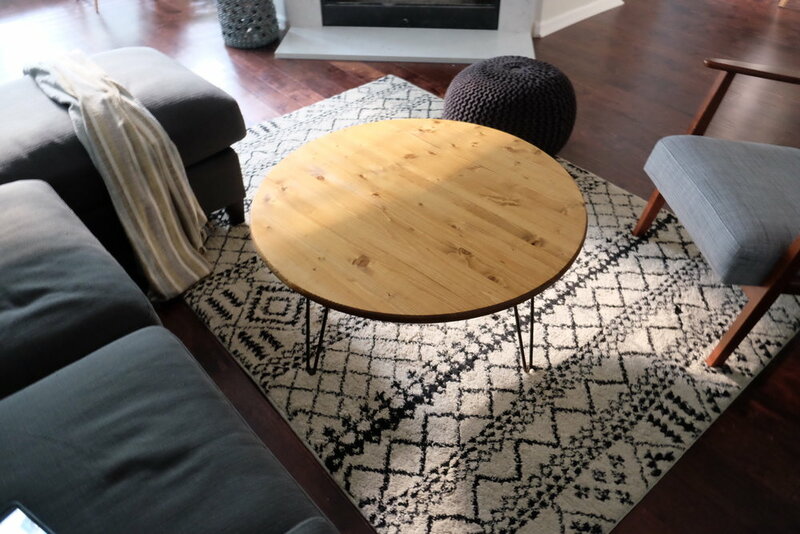 When I first looked at my condo, one of the biggest question marks that arose was how I would arrange my furniture, television, and other belongings around the living room. It's not quite any one shape: it's one part square, one part rectangle (although I guess all rectangles are part square? ), and one part triangle--mostly due to the fireplace sitting on a diagonal wall. And believe-you-me, I haven't really had the furniture arranged any one way for more than a few weeks at a time for the entire year that I've lived here. First off, there isn't an entirely intuitive wall to put the television on that would be parallel to any logical sofa placement. I thought for a HOT SECOND about not putting the TV in the living room at all, and instead putting it in the second bedroom, but I quickly realized that that wouldn't lend itself well to my lifestyle (and by "lifestyle" I mean "Netflix binge-watching habits"). With that in mind, the first location where I imagined the TV was above the fireplace, because that would make the most sense in terms of TV-to-sofa line of sight. The more I thought about it, though, the less I liked the idea. The TV would be too high for comfortable viewing, and sometimes I feel that TVs above fireplaces are a bit of a clunky eyesore (and after spending the resources to reface my fireplace, I certainly didn't want to detract from any of it's glory). I also knew that I wanted to hide the television cords behind a wall, and that didn't really seem possible with the fireplace directly behind it. The next wall to seem to make the most sense was the wall parallel to the bay of windows in the sunroom. I liked this idea the most because 1) it gave me the opportunity to hide the cords behind the wall, 2) because I would be able to see the TV from the kitchen, and 3) because I could envision some sort of gallery wall surrounding the mounted TV. Sold. With that decision made, I needed to decide how I would arrange the seating area in relation to the TV. So, like a crazy person, I've sketched up a few diagrams to help me make up my mind. Regardless of the layout, I knew that my new sectional would be staying on the wall perpendicular to the television. Admittedly not the most ideal placement in terms of cozy TV viewing, but after testing the layout for a couple months (before permanently installing the TV onto the wall), I realized that it didn't really bother me at all, and made for the best flow around the space. This is how I initially envisioned arranging the furniture because it really defines the "living" space of my open floor plan. I'm wondering, though, if it cuts off the space a little too much? The problem with the "living" space of the condo is that it is pretty small when you think about it, so trying to fit in three seating components becomes a bit cumbersome. This layout feels the most symmetrical and traditional, but it doesn't leave a lot of space for walking around the space. It feels a bit congested, but I do like how the armchairs frame the fireplace (Note: the chaise on the sectional can be switched to either side). This is how the room is laid out currently. I like it, buttttt. I don't know. I think I wish that there was more space for more seating. But, let's be honest, I'm not really throwing parties on the reg. Is this the winner? It might just be that the color is a little too light, but I haven't gotten around to restaining it a darker color. Any thoughts?! I could use some opinions!